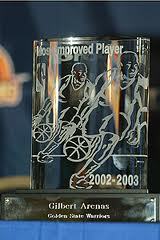 Spits Game: NBA Most Improved Player... Who Really Deserves This? It’s pretty obvious what I’m talking about here. I’ll start off with Omer Asik because the team that signed him absolutely knew what they were going to get from him when they signed him to that fat free agent contract in the off-season. The nerds in the Houston front office ran all the numbers in the computer and determined he was going to be a foundation for them. The 3rd year big man from Turkey was Joakim Noah’s understudy for his 1st two seasons in Chicago before averaging a double double this season and finished 3rd in the league in rebounding. The blockbuster Dwight Howard trade in the off-season that sent Andre Iguodala to Denver, Bynum’s hair show and knees to Philly had everybody asking “besides draft picks, what did Orlando get out of this?” The answer is a pretty damn good player that was thought to be a mere throw in, his name is Nikola Vucevic. After playing limited minutes as a Sixers rookie, he also averaged a double double this season and rebounded at a high enough clip to finish 2nd in that category behind Dwight Howard. These are the guys that took advantage of an opportunity that came their way. A popular name that has been getting some mention is Greivis Vasquez. A guy that has been predominantly a quality reserve was handed the keys to a crappy team this season. Considering that the team is still crappy, i don’t see what the buzz is about. His shooting percentages are relatively the same as before. The thing that is impressive is in only nine increased minutes, he’s turned in legit point guard numbers at 9 assists per game. Like I previously mentioned, Iguodala departed from Philly and at the same time freed up Jrue Holiday to become the primary ball handler that the organization intended him to be. As far as numbers go, his improvements were quite similar to Vasquez. What separates the two players is Holiday didn’t start the season with a clean slate and had less room to improve. I need not hype him up anymore as he was selected as an All Star this season. A guy that is starting to get more exposure is Paul George, also an All Star. I raved about his improvement on twitter LAST season where he made a similar leap that he’s made this season. The only difference between now and then is that he’s become the man on the Pacers with Danny Granger being injured this season, his field goal percentages and his shot selection has dropped off slightly which is expected with the increased attention on him. I started by saying how difficult this thing here is to determine, here are two off the wall but legit people to look at. Mainstream media discriminates against the guys that are already running this league for this category. Kevin Durant is a different player this season after suffering the NBA Finals disappointment of yesteryear, he’s definitely added a mean streak to his on court demeanor. Already recognized as the best scorer in the league he’s improved his shooting in all facets. Its well documented how he’s earned his way into the 50-40-90 club; 50% overall from the field, 40% from the land of three, and 90% from the charity stripe. He’s scored at a better at rate this season than last while taking two fewer shots. KD has also concentrated more on the defensive end, he’s recorded career highs in blocks and steals. Lebron James appears nightly on every single show about the NBA. I won’t bore you with the same rhetoric that annoys me on the regular. (I’ll save that for the MVP discussion). What I will say is the man has improved his game by becoming a better post player and post defender. He’s taking smarter shots, and since that championship monkey was taken off of his back he’s stroking that long ball with confidence. If what I’m saying isn’t convincing enough, read this article. It's a shame that the Superstars are excluded by those that actually vote on this thing. There's list of guys that I chose not to go into detail about; Kobe Bryant, Carmelo Anthony, even Tim Duncan to a certain extent all have elevated their games to another level. The candidates that I mentioned in the first two groups have developed their skills in a manner that is actually expected from professionals. It's natural for players numbers to improve with increased playing time and opportunity. I commend them for that, but they shouldn't be rewarded for something that they are supposed to do. If I had to choose a winner, I'll give it to the best guy on this list that's not going to be the MVP because of Lebron James. Kevin Durant was last season's scoring champion and posted career highs in five different areas other than scoring. Please leave comments. I’m interested in what you think about this particular conversation. I think the big man from Orlando deserves this award. No one expected him to do much at all in Orlando and he came out and put in work. According to the manner in which they're proceeding with this award, Vucevic should definitely win it. I can only imagine what type of team Philly would be if they kept him and removed play-making responsibilities from Iggy.